The average weight of ham is 7 lbs. to 10 lbs. You cannot stop closing your eyes when the fat of the Iberico Ham de Bellota Fermín Boneless melts slowly by the heat of the mouth and feel the tasty flavors of sweet and salty nut. Brought to you from La Alberca, Salamanca Spain, now for your enjoyment in the U.S.
At the west of Spain, in a beautiful mountain village of La Alberca, the warehouses of Fermín Brand are located; in this place is where the Iberico Ham de Bellota Fermín Boneless is cured and previously the manufacturing process of this real culinary treasure like Iberico Ham de Bellota Fermín Boneless had begun. 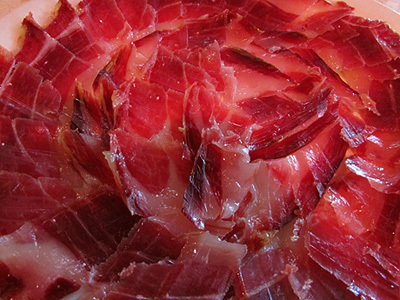 At the beginning the purebred Iberian pigs from which this delicacy is made are selected. Black Iberian pigs running freely in family groups, fed mainly on sweet oak acorns, they also consume herbs and wild grasses. These acorns give a delicious nutty flavor to the Iberico Ham de Bellota Fermín Boneless and are full of antioxidants that allow the pork meat is cured for long periods with a small amount of salt. The Iberico Hams de Bellota Fermín Boneless are hung to dry in winter. As the season changes and the temperature rises, complex chemical changes occur that transform the meat into the Iberico Ham de Bellota Fermín Boneless. The combination of thousands of flavor compounds makes of the Iberico Ham de Bellota Fermín Boneless one of the treasures of Spanish culinary culture. During this time, the “Maestro Jamonero” controls the entry of fresh air from the mountain to the warehouses. Its mission is to keep temperature and humidity levels suitable for obtaining an impeccable Iberico Ham de Bellota Fermín Boneless. The Iberico Ham de Bellota Fermín Boneless is cured for longer than any other iberico ham, due to the antioxidants present in the diet of acorns. The diet of the pigs and their active life, make possible to start on the infiltration of fat between the muscles that produce the colorful marbling in the Iberico Ham de Bellota Fermín Boneless which is a pleasure for all the senses. 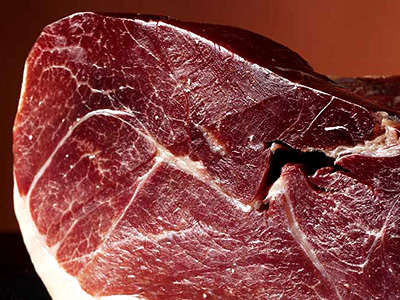 Because of the diet based on acorn, the meat of the Iberico Ham de Bellota Fermín Boneless is high in monounsaturated fat, so it is a heart-healthy food for excellence. Why selecting an Iberico Ham de Bellota Fermín Boneless? 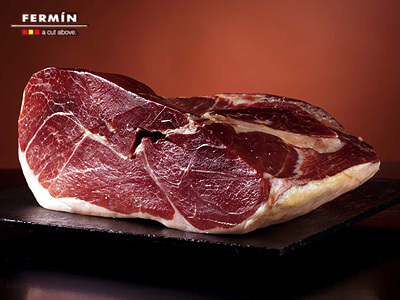 This product, the Iberico Ham de Bellota Fermín Boneless belongs to the highest food categories, it is ideal for a healthy and balanced nutrition due to its large nutritional properties such as proteins, vitamins like B1 , B6 , B12 and folic acid which are very beneficial for the nervous system and brain function. Also Iberico Ham de Bellota Fermín Boneless is rich in vitamin E, which is a powerful antioxidant, also has minerals such as copper, essential for bone and cartilage, calcium, iron, zinc, magnesium, phosphorus and selenium, the last very linked to delay aging processes. Some of the main features of this Iberico Ham de Bellota Fermín Boneless is that the fat of the Iberian pigs, fed mostly on acorns, has a high content of monounsaturated oleic acid, about 50 %. This type of fat, as has been shown in scientific studies, produces a favorable effect on cholesterol in the blood by increasing the rate of good cholesterol (HDL) and reducing the rate of bad cholesterol (LDL). 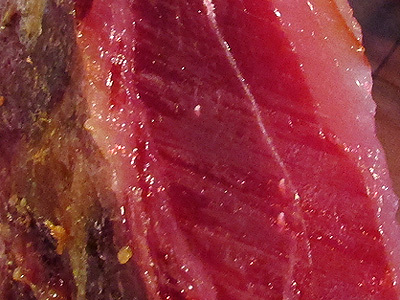 Only virgin olive oil has oleic acid content higher than the Iberico Ham de Bellota Fermín Boneless. The merit is not only because of the breed of pig , also has a great influences the feeding on acorns and grass that are mainly the foods provided to pigs in free regime breeding , from which is obtained the Iberico Ham de Bellota Fermín Boneless. 100 grams of Iberico Ham de Bellota Fermín Boneless, provides the body with something less than 250 kcal, so that a moderate consumption will not harm low-calorie diets. 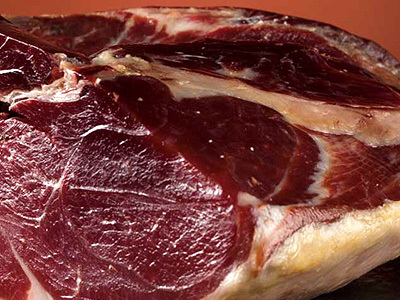 As 100 grams of Iberico Ham de Bellota Fermín Boneless contain 43 grams of proteins, the Iberico Ham de Bellota Fermín Boneless is also a substitute for red meat. The company “Embutidos y Jamones Fermín” is a unique project founded in 1956. With a long tradition of knowledge that has been transferred from generation to generation and has managed to become the first farm of breeding of the pure black Iberian pig, where these animals find food that helps them to achieve the quality of their products. FERMÍN brand with a tradition of more than half a century exporting its products to many countries, prevail the quality of their products and style of work that has provided it countless awards, as well as the award for "Best Spanish Food Company" in 2006.